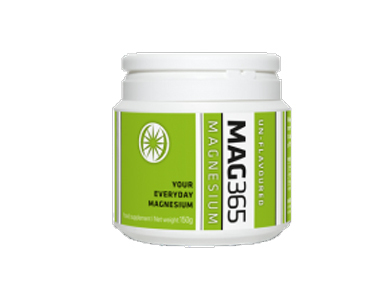 Buy Mag365 Magnesium Powder 150g Unflavoured in the UK from our online shop or directly from our independent Scottish store. If you want to automatically receive an email when 'Mag365 Unflavoured 150g' is back in stock, just leave your email address below. Magnesium powder is from 100% natural magnesium and helps to dissolve excess calcium in the body. Relief to many symptoms of magnesium deficiency. Mag365 magnesium supplement is a proprietary process that provides the most absorbable, effective, fast acting magnesium available anywhere. It is 100% natural magnesium and helps to dissolve excess calcium in the body. Relief to many symptoms of magnesium deficiency. Magnesium and calcium are fundamental nutrients that need to be in balance with each other in order for you to fully experience good health. Their importance on a cellular level is critical. Calcium and magnesium are like opposite sides of a coin. Calcium makes muscles contract. Magnesium is necessary for muscles to relax. Calcium excites nerves, while magnesium calms them down. Calcium is needed for blood clotting, but magnesium keeps the blood flowing freely. In our opinion, people are more magnesium deficient than calcium deficient. Ionic Magnesium Citrate (Proprietary blend of magnesium carbonate and citric acid, which, when combined with hot water, creates magnesium citrate.) No sweeteners or artificial flavours. We sell real Mag365 and other Minerals A - Z directly from our shop in Scotland and online throughout the UK. View more products from Mag365. Where can you buy real Mag365 Unflavoured 150g safely online? If you are wondering where you can buy Mag365 Magnesium Powder 150g Unflavoured safely online in the UK, then shop with us. We are an actual health foods shop; with real people selling real foods and products. Our award-winning independent shop is located in Stirling, Scotland since 1976. You can buy our Minerals A - Z in store or safely place an order with us online or over the phone. Mag365 Unflavoured 150g - Mag365 Magnesium Powder 150g Unflavoured in Minerals A - Z and Vitamins and Minerals.